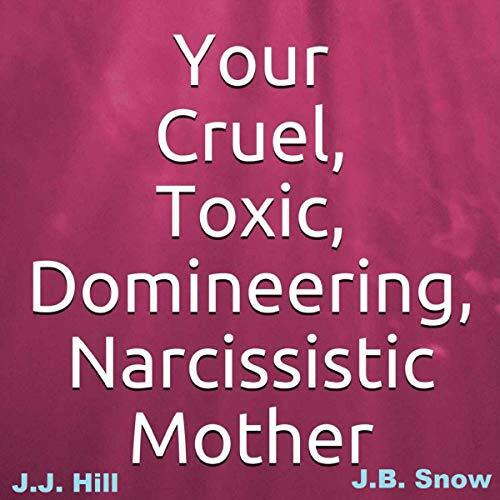 Do you live under the power and control of a domineering, toxic, cruel, and narcissistic mother? Are you constantly in fear of their retaliation when you are seen as "disobedient" to them? Is one child the scapegoat while the other is the "golden child" in the family, even as grown adults? Do you feel like a small child again in the presence of your parent, even as an adult? Does your parent continue to disrespect you and treat you like a child, constantly telling you what you should be doing with your life? Does your parent fail to allow you to be autonomous, constantly relying on you to be their own personal entertainment? Does your parent make you be the parent to them, constantly whining and nagging you to do their chores, pay their bills, and more? Does your parent think you "owe" them for the rest of your life just because they gave you a roof over your head during childhood? Is your parent spoiled, unreasonable, sadistic, passive-aggressive, and insidious in some of their behavior? Unfortunately, I can relate to the toxic and domineering traits of a narcissistic parent. We may not always be aware that our parent is the way they are because it was all that we knew growing up. It is difficult to see what our minds do not want us to believe. No one wants to admit that their parent did not show love or was toxic or broken. Nobody wants to admit to themselves that they were preconditioned over the years into thinking that their parent always knew what was best; however, they did not know what was best. In fact, your toxic mother left you with a disproportional outlook on society and life. It is natural to side with your parents, as that is how we are born to think. We do not want to believe that our parents taught us the wrong ways to do things or imprinted immoral traits on us. Your parent may know how to get ahead in this world by doing illegitimate practices or deceitful things to get ahead from their experience, but that does not have to be your reality. You can choose to learn and grow so you can rid yourself of this toxic baggage. Toxic mothers are not aware of their toxicity, controlling, and manipulative natures, as they know those tactical devices get them ahead in this world. Ironically, a mother will teach and show their children how to be successful the only way they know how. The problem here lies in the fact that they have deficits of their own and cannot see past them. Your mother may know what works, but that does not mean that it is the “right” path to take. This audiobook will explain all the different potential disorders you may be dealing with and how to find the toxic traits in your mother. You will understand the toxic traits, cruel behaviors, and domineering tactics deployed by our mothers. You will learn how you can fall prey to our mother’s narcissistic whim and why we are just a pawn in the whole scheme of things to our parent.